History is a viewport on to the past, with the aid of retrospective knowledge. In the present, it is often difficult to understand as situation because much knowledge is not revealed. And, this is certainly the case of the rise of Japan during the early 20th Century. And, specifically, only in retrospect, do we understand that Mitsuru Toyama – widely known as the “Shadow Shogun” and “Boss of Bosses” was the hidden driver behind much of it. Mitsuru Toyama was charismatic, complex, and controversial figure in his lifetime, and remains so to this day. His actions were hidden behind the Black Ocean Society and Black Dragon Society, the two organizations that he founded. Despite his ultra nationalism, Toyama was paradoxically on good terms with Onisaburo Deguchi, Japan's most fervent pacifist. Toyama’s rise to power is perhaps best explained through a confluence of forces that created a perfect storm. And, yet, any such explanation is still full of contradictions. Toyama was born into a poor family but of samurai descent. The underlying code and current role of the samurai in his youth was formative in Toyama’s early development. The samurai was the aristocratic warrior, the defender of the state and the people. Spiritually, the samurai gave complete allegiance to Amaterasu, the Sun Goddess. And, by birthright, such allegiance was transferred to the present day Emperor, even though the Emperor’s power was in decline during the Tokugawa rule. In the 19th Century, the diminishing status of the samurai gave rise to the modern day ronin. Stripped of power and dignity in country where “loss of face” is rectifiable only through suicide (harikari), the 19th century faux ronin is a lost soul, a vigilante who often takes justice into his own hands, justified only through one’s own beliefs. It was a frustrating and increasingly humiliating position in society, sowing the seeds of discontent. Those seeds would germinate in a nationalist movement in the late 19th and early 20th centuries. The movement was a mechanism to recover dignity lost over the previous centuries. Toyama subscribed to all of this, even though he himself was too young to actually be a samurai. On July 8, 1853, American Commodore Matthew Perry led his four ships into the harbor at Tokyo Bay, seeking to re-establish for the first time in over 200 years regular trade and discourse between Japan and the western world. In the United States, we euphemistically call this, the “Opening of Japan.” The “Opening of Japan” brought new goods and a new way of life – a “better” way of life it was argued– to Japan. Japan was a new market for America to sell its good and stoke its economy. Further, a port in Japan was a convenient stopover point to the rest of Asia. Back in the day, and even today, we can, rightfully or wrongfully, morally or not, view this through the lens of “Manifest Destiny” – America’s God-given right to not just North America, but beyond. The Opening of Japan accelerated the fall of the Tokugawa reign (also known as the “Edo Period”). Japan was largely destabilized, and power was returned to the Emperor with the support of restless samurai class, led by Saigō Takamori in 1866. After the death of Emperor Komei in 1867, Emperor Meiji ascended to the throne, the epoch of the Meiji Restoration. 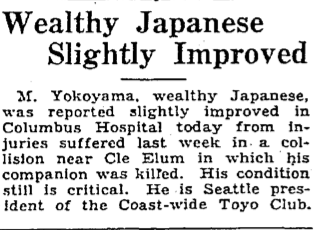 The Meiji restoration was transformative. It moved from Japan poor agrarian country to an industrial power, adopted a (Western) constitutional government, encouraged the influx of western values and goods, strengthened Japan’s military, and continued to diminish the role of the samurai in the modern world. The latter resulted in the Satsuma Rebellion in 1877, again led by Saigo Takamori, a failed attempt to bring power and dignity back to the Samurai. Toyama supported the Meiji Restoration in its return of power and national allegiance to the Emperor, its transformation of Japan as an industrial society, and its strengthening of Japan’s military. However, the continued degrading of the samurai (in 1867, 1.9 million samurai were paid off with government bonds to literally give up their swords) and increasing influence of the outside world (especially America), were diametrically opposed to Toyama’s emerging values. After the Satsuma Rebellion, Toyama grew increasingly nationalistic, more hateful of outside influences, more hateful of White people, increasingly deferential to the Sun Goddess, and more radical in his believe in Japan’s destiny to be the leader of the world. While many people likely believed similarly, they were likely a silent minority and not organized. Many were indeed descendance of the samurai class, whose rights, privileges, and basic way of life had been stripped from them during the Meiji Restoration. Then, in 1881, Toyama formed the Genyosha -- the Black Ocean Society -- in Fukuoka, Toyama’s hometown. It started as a small grassroots movement – small secretive meetings of like-minded disaffected samurai. He had a message and a charismatic delivery; “Japan First.” An intrusion from international forces is taking your prosperity and well-being. And, our government is not to be trusted to help us. It was a nationalistic message that played well to the disenfranchised samurai. But it had broader appeal – the transformations of Japan were breath taking. Whether it was actually good or not, people feared change; the Opening of Japan meant industrialization, government transition, and Westernization. Perhaps it was the latter than was feared the most – the insular Japanese culture was being attacked from abroad. Beyond the samurai, Toyama had a simple message, probably short of a platform of any depth, that resonated with many. It was a populist movement in Japan, led by Toyama. Even though it was a secret society, his message spread throughout the country. As a political organization, the Black Ocean Society accrued increasing power. It supported and elected candidates that aligned with its goals. The tactics that the Genyosha was prepared to use to achieve its goals were also far from peaceful. It began as a terrorist organization, and although it continued to recruit disaffected ex-samurai, it also attracted figures involved in organized crime to assist in its campaigns of violence and assassination against foreigners and liberal politicians. In 1889, the Genyosha strongly criticized the unequal treaty revision plan drafted by foreign minister Ōkuma Shigenobu. A Genyosha member threw a bomb which wounded him severely. In the election of 1892, the Genyosha mounted a campaign of intimidation and violence with the tacit support of the Matsukata administration to influence the outcome of the election. The Black Ocean Society’s goals extended outside of Japan. It supported the annexation of Korea and the overthrow of the Qing Dynasty in China. The assassination of Queen Min of Korea in 1895 is believed to have been conducted by Genyosha members. Curiously, it aligned and fought with secret Chinese societies. These societies shared a common goal with the Black Ocean Society to fight the Qing Dynasty but also fought with the Black Ocean Society because it encroached on their territory and influence. So, its relationship with these Chinese forces was a complicated one where they were both partner and foe. In 1901, Toyama formed the Black Dragon Society with Ryōhei Uchida, supposedly as a successor to the Black Ocean Society (supposedly, because the Black Ocean Society continued to operate in parallel). It was an ultra nationalistic, paramilitary, and right-winged secret organization. The Black Dragon Society wanted to distance itself from the criminal elements of the Black Ocean Society. In actuality, the Black Dragon Society was more violent, more subversive, and more influential than the Black Ocean Society. Its ultimate goal was quite literally to take over the world. While the organization started in Japan, it quickly spread to China, India, Korea, Southeast Asia, Russia, and to the Middle East. It’s interest spread West, to the United States, Mexico, and South America. Because of the importance of trade routes, the Black Dragon Society agents found their way to the Caribbean and of course Panama, the location of a new canal that opened in 1914, connecting the Atlantic and Pacific Oceans. It was an ultra nationalistic, paramilitary, and right-winged secret organization. Toyama’s befriending of Sun Yat-Sen and Chiang Kai Shek proved to be most valuable to the Black Dragon Society’s cause. With the aligned goal to take out the Qing Dynasty, Toyama’s alliances and friendships with these men were invaluable. The relationships were deeply personal. When Sun sought refuge from the Chinese and Japanese officials, and Tong assassins, he stayed under Toyama’s roof where he plotted his revolution. Together, they worked on violent campaigns, typically subversive and military in nature, to fight the Qing Dynasty and other disparate forces in China. Of course, these alliances were fraught with conflict, and all parties knew it. Ultimately, Toyama (and Japan) wanted to control China (and beyond), as did Sun and Chiang. Support of politicians that advocated the Black Dragon Society’s nationalistic agenda was the typical means of influence. Money flowing from a variety of sources, some legal, most illegal, was the principal means to prop up candidates. Assassination was a preferred tool of Toyama and the Black Dragon Society to eliminate political adversaries. Threats to supported candidates that did not follow the Black Dragon Society’s agenda were also more effective, knowing the brutality brought to adversaries. The secretiveness of the Black Dragon Society provided much cover for their violence. Oftentimes rogue sympathizers acted on their own accord and attributed their actions to the Black Dragon Society. Or when the Black Dragon Society did act, enough confusion existed that allowed them to escape culpability. By the 1930’s, Japan no longer feared Russia as an adversary. After defeating them in the Russo-Japanese War in 1905, Japan had continued to assert more power over Russia, and focused on it’s immediate concern -- Manchuria. On September 18, 1931, a small explosion on the railway owned by Japan’s Southern Manchurian Railway near Mukden damaged the rail line. It was so small that within minutes, the line was repaired and train service resumed. Japan’s Imperial Army accused Chinese dissidents of a terrorist attack against Japan and Japan responded was a full-scale invasion to Manchuria and established it as a puppet state of Japan. It was later established that a small quantity of dynamite detonated by Lt. Suemori Kawamoto of the Japanese Army, not a Chinese dissident, was the cause of the explosion. Further, it was Toyama Mitsuru and the Black Dragon Society that orchestrated the event. Yamamoto, back in Seattle, sat behind Yokoyama desk at the Toyo Club. Yokoyama was away, in Eastern Washington. Officially, he’s out hunting for mushrooms – the elusive matsutake, the prized fungus of the Japanese people. It’s probably true, but it’s also a cover for him to visit one of the Toyo Club’s gambling establishments in Yakima. A small flare up resulting in a shooting/murder that needs some attention. Yamamoto puts his feet up on the desk. All was mostly in order. With the opium business being shutdown, he had turned much of his attention to other businesses – prostitution, gambling, canneries and fishing. The Toyo Club’s encroachment south into the Los Angeles basin was now taking up more time. Not surprising, the Little Tokyo Club was concerned about the Toyo Club’s presence. San Louis Obispo, and Pismo Beach and Ensenada have been flashpoints of conflict. Even though the drug business through Pismo Beach and SLO have slowed considerably since curtailing their wholesale drug business, Yamamoto has made inroads – allegiances skew towards the Toyo Club for all the money it has brought in via fishing and drugs. Yamamoto considers conciliation and partnership are the right overtures – not a turf war. With Yokoyama away, Kanekichi contemplates his role. His station. Yokoyama would soon be retired. He had done a good job to grow the Toyo Club. Of course, much of that was Yamamoto’s doing. Most all revenue operations were under Yamamoto’s control. Drugs and gambling dwarfed all others, and his “hands on” approach was necessary for their success. He was heir apparent to lead the Toyo Club on Yokoyama’s departure. That said, Yokoyama was vulnerable. Most all knew it was Yamamoto work that made the Toyo Club successful. The right hand man had gained much power. Yamamoto was concerned about the transition of leadership. First, how would he assure his ascent to the top of Toyo Club Empire? How could he avoid a bloody, violent takeover? And while his confidence was not overconfidence, he asked himself, once in charge, what would be his mark that he would make? Four raps at the door were heard. It was Yamasaki, Yokoyama’s right hand man. Yamamoto invited him in, and he quickly shuffled in, bowed, and deposited a letter on the desk. Words were not spoken, and Yamasaki bowed turned, and quickly departed. Yamasaki’s deference to Yamamoto was clear. While it iswas demanded since Yamamoto was in charge in Yokoyama’s absence, Yamasaki also knew that Yamamoto was heir apparent to lead the Toyo Club. No use squandering the opportunity to curry favors and signal allegiance. Yamamoto opened the letter. It was a confidential letter sent through the Japanese Consulate in Seattle. Such letters have been more frequent in the past year. Some were from military attaché to check in with Yamamoto. Others were from Toyama, who was increasingly communicative. The drug business was vital to his operations. Money was the lifeblood of the Black Dragon Society. Without it, it could not fund its political ambitions, military operations, or covert activities – such as the increasingly common assassinations of those in the way. With the large drop off revenue from the wholesale opium business, Toyama was increasingly interested in enlisting Yamamoto. Would the money supply dry up was his biggest concern? And, if so, could Yamamoto be counted on regardless? It was a delicate balance between further indoctrination to the cause and threat if the money flow slowed. In this letter, Toyama informed Yamamoto of the Mudken Incident, happening just days before. Without his patriotism (aka money), the operations would not have been possible. It’s part of the greater noble cause. For Japan. For Amatarasu. For Hirohito. America was increasingly threatened by Japan. Japan’s invasion of Manchuria had her on heightened alert. The United States government had secretly backed Chiang Kai Shek and the KMT against the Qing Dynasty. However, the regional politics were complicated. The United States did not trust Russia nor did it want to align with Japan too closely. And, among the multiple warring factions within China, it was unclear who supported whom. It was difficult to understand who was aligned with whom. Understanding Japan’s intention was critical. That said, while the United States was aware of the Toyo Club’s mob activities; it was less aware of its role in relationship to Japan’s nationalistic agenda. In general, the Japanese in America were hard working, law-abiding people. Many were foreign nationals, some with children born in the United States, hence US citizens. Many, if not most, of those that came to Japan had plans to return – once accumulated enough wealth. Of course, such dreams were commonplace among all immigrants, but, for a variety of reasons, most ended up staying. On arrival, life was difficult for the Japanese immigrants. Slowly but surely, they laid down roots, built families, and began to prosper. Assimilation, regardless of how hard they tried, was a bit difficult. Unlike their European counterparts that came to pursue “the American Dream,” their physical features stood out from the predominantly white America. Also, language, both the written and spoken forms, were dramatically different than the Anglo-based languages that are far more similar to English. Because they looked different and talked different, there was often a distrust of the Japanese. Further, their customs, such as religion and food, were, well, foreign, to many Americans. While familiarity breeds comfort, differences bring suspicion, whether warranted or not. And, of course, as a rising power in the East, Japan, and by association, Japanese immigrants made many Americans uncomfortable. At yet, there was an unspoken integration between the Japanese and white Americans. 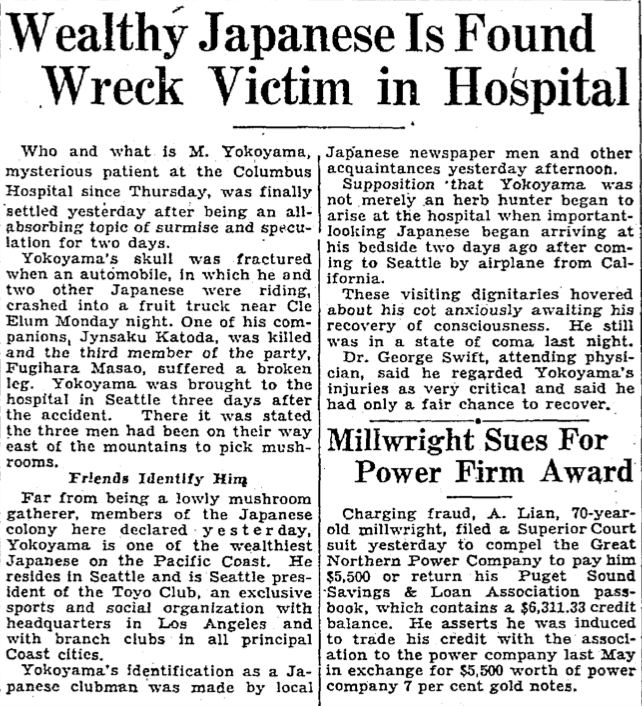 Japanese immigrants farmed the land to bring food to America, trade with Japan (as predicted by the “Opening”) was prosperous, and, the Japanese ghetto provided entertainment – much of it illicit for Caucasians in America. Drugs, of course, but also gambling, alcohol, and, especially prostitution. Even though white clientele was segregated from the Asian customers, prostitutes of all “varieties” were available. The “submissive and exotic” Japanese woman was particularly desirable for white men looking for fun, entertainment, and love. It was an unspoken, largely peaceful coexistence, at least on the surface. Unconscious prejudice, fear, and distrust lurked beneath the surface. Japan’s rising adventurism in Asia and America’s growing concern with Japan weighed heavily on Yamamoto. He was a proud Japanese with devoted allegiance to the country, if not the emperor. However, he knew Japan’s rise to power was messy, violent, and oftentimes subversive. His support, first unwittingly by lining Toyama’s coffers with drug money, had grown over time. As tens of millions of dollars flowed to Toyama, he was keenly aware of how his actions were crucially important to the rise of Japan through these means led by Toyama. His success as a pragmatic and successful businessman, albeit one who engaged in questionable if not illegal activities, in the United States was critically important to funding Toyama. Walking away from the drug business certainly reduced the “heat” he was getting from the Federal government. His work with Capone had raised his profile. J. Edgar Hoover himself was personally interested in Yamamoto. With Capone in jail, the FBI could turn its attention to Yamamoto. Instead, pursuit of Yamamoto diminished, possibly because the drug business was dying. More likely, they probably realized there was likely more to Yamamoto than drugs and they wanted to quietly gather more intelligence. Yamamoto realized he had just finished a chapter in the book of his life. He had done all that he could with the drug business. A new chapter would start when he took control of the Toyo Club. But what would that chapter be? As he contemplated this, he pulled out the letter from Toyama to re-read it. He realized – this was not a plea for money. Instead, it’s a Higher Calling. Long live the Second Son to the Western World, the Calling is for Japan to assert it’s rightful place as a World Leader. It’s a calling to Make Japan Great. It’s a calling to fulfill one’s destiny. To fulfill Japan’s destiny. On September 21, 1931 in Cle Elum, WA (a small town in Eastern Washington), a fruit truck crashes into a passenger vehicle. One occupant dies immediately, two others are injured. One suffers a broken leg, the other was in a coma with a skull fracture. While tragic, such accidents oftentimes go unnoticed. In this case, it does not – the man in the coma was M. Yokoyama, who had not returned from his mushroom hunting expedition. 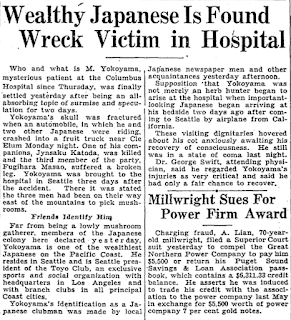 The Seattle hospital where Yokoyama was admitted reports several “dignitaries” from California hover over Yokoyama, anxiously awaiting whether he will recover. He does not. He dies on September 28. 1931. 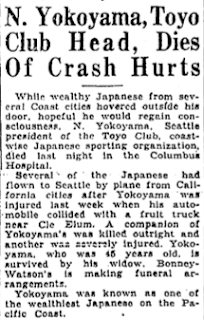 With Yokoyama dead, the men from California hurry over to the Toyo Club, 231 Maynard St. They forcibly enter the Club, only, to their surprise, find no resistance. They make their way to the third floor to find the door to Yokoyama’s office slightly opened. A small crack. They quickly push the door open, as if to surprise who might be there. They assume it would be Yamamoto. Instead, they find an abandoned office. In fact, they realize the entire Toyo Club had been emptied out. A single note sits atop of Yokoyama’s desk. An address: 655 Weller St. Multiple levels of confusion erupt. What has happened the Toyo Club, bustling just days ago? Who was in charge? And, 655 Weller St. – that in Los Angeles, near the Tokyo Club and the offices of Dr. Furasawa at 317 ½ Weller – a shadowy character supposedly working with the Japanese government? And, of course, what should be done? The men from Los Angeles, high-ranking members of the Tokyo Club, are here to square things away, in anticipation and now reality of Yokoyama’s death. The uncomfortable truce with the Toyo Club had been simmering. A conflict that boiled over was not in the interest of either club. And, yet, neither wanted to cede control to the other. Who would control whom? With the sudden and mysterious death of Yokoyama, how would they proceed? A bloody confrontation was possible, but desirable by neither. M. Sera, the head of the Tokyo Club was one of the men in Seattle. It was a surprising visit for a man of his stature. However, Sera recognized the importance of Yokoyama and potential volatility resulting from his death. So, he made this trip. It was Sera that realized that 655 was only a block away, around the corner. In fact, he pondered if there was even a secret passageway between the builds. “655 Weller is around the corner,” Sera asserted. “Let’s go.” The men quickly descend the steps of the former Toyo Club and exited into the sunlight. They were a mere minute away. At the entrance to 655 Weller, a man has been waiting for them. The man was Yamasaki. “Your arrival has been anticipated,” Yamasaki said, coolly and confidently. “Come with me.” He led them into the new building, and, as with the old Toyo Club up two flights to the third floor. The floor layout was uncannily similar to the old Toyo Club. Again, the door leading to an office was slightly ajar. Yamasaki led Sera and his entourage in. Sitting behind the desk, looking down, was a man. His face was covered by his Stensen hat. He looked up. Directly at Sera. Yamamoto rose from his chair. He reached into this holsters, raising the stakes of the interaction. Slowly and deliberately, he pulled out his two pistols….and then sets them on the table. It disarmed Sera and his men. “Yokoyama’s death was sudden and unfortunate. I’m glad you’ve come to pay your respects. But, you knew, as well as I knew, his time was coming. But perhaps not yesterday. It was an untimely happenstance. Fear not. Take not. Go home assured. There is no gain in violence. We have a common calling. A mission. With that, Yamasaki escorted the men out of the office, down the two flights of stairs, and out the door to the street. The men leave to return to Los Angeles. It was clear that Yamamoto has taken control of the Toyo Club. On the minds of all, but especially Sera, was what was in store for the Little Tokyo Club?